The UK Vegetarian Society has declared May 19-24 to be National Vegetarian Week. Regular readers will know I’m a confirmed carnivore but I do cook quite a lot of veggie recipes, partly for non-meat-eating friends, partly because they make a pleasant and healthy change and partly because Him Outdoors is a demon gardener and we have a lot of home-grown fresh veg. 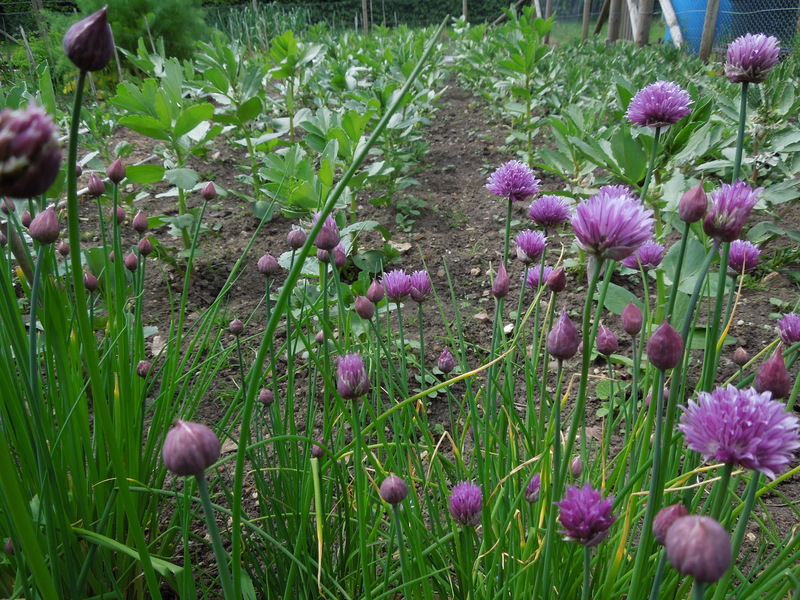 A keen eye will spot the baby broad beans behind the chives. So to save you from trawling through a year’s worth of recipes, here are my edited vegetarian highlights. 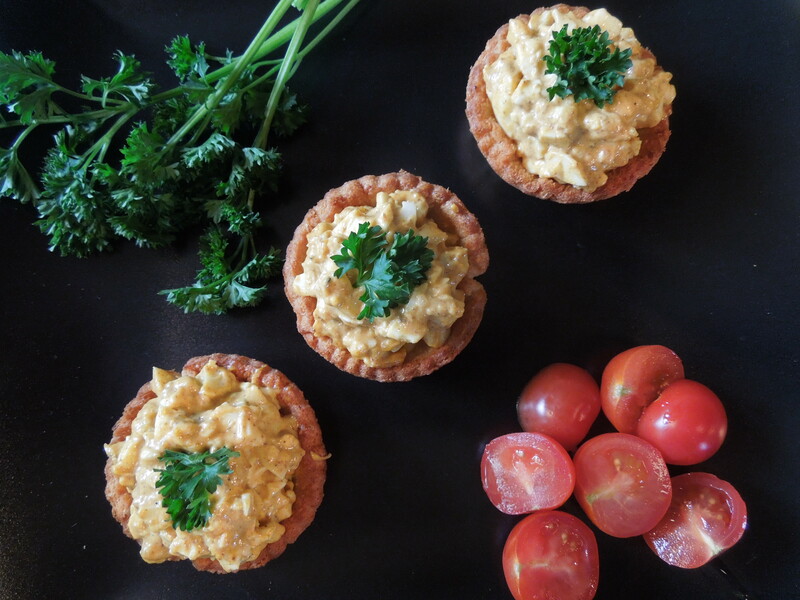 Really Quick Canapes: handy little tartlet cases you can whip up quickly and fill with whatever you please. Four-Cheese Pots: a cheat’s souffle and good as either a starter or light lunch. Asparagus Soup and Arancini: make the soup from the asparagus trimmings or go the whole hog (sorry for the inadvertent meat pun) and splurge with a big bunch of spears. Good hot or cold. Arancini are crispy-coated risotto balls – a great use for leftovers. Winter Warmers, Super Soups: a laksa (check the veggie options) and a spicy pumpkin soup. Summer Salads and Pots of Pesto: home-made pesto and some light and refreshing summer salads. Spring Vegetable Risotto: delicate, delicious and so good even Him Outdoors didn’t miss the meat. Gnocchi-ing at Heaven’s Door: wonderfully light Italian gnocchi made from ricotta and spinach. Pippa’s Pancakes: a recipe I made up for my veggie friend Pippa when she complained I was posting too many meat dishes. Lovely for a supper party with a salad on the side. Onion and Taleggio Tart: easy and absolutely mouth-watering. Feeding the non-Meat Eaters: another tart that looks as though you’ve spent ages making it when actually it’s ridiculously quick and easy. Handy for when you have unexpected guests. Go To Work On An Egg: a frittata and a flan. Veggies can (sorry) skip the ham in the flan and replace with something less porcine. Gluts and Gluttony: how to use up all those courgettes you love at the start of the season and will soon be leaving anonymously in bags on your neighbours’ doorsteps. Courgettes – A Second Helping: a three-course meal with courgettes in every course. Ok, some chorizo crept in in the main, but vegetarians can leave that out. 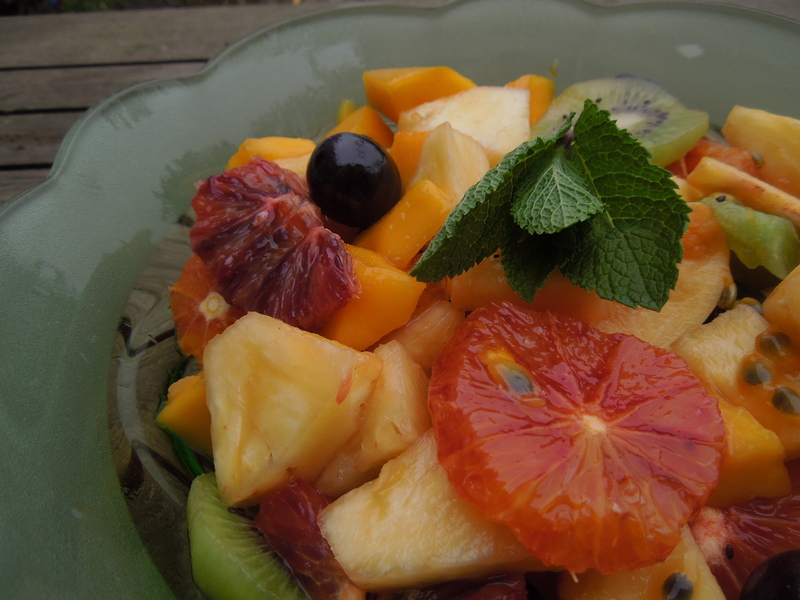 Exotic Fruit Salad with a Mint and Ginger Syrup: a light and healthy end to a meal with a hint of mint. Liz’s Luscious Chocolate Mousse: so good the family have been known to eat two at a sitting. Raspberry Syllabub Trifle: an old English dessert that gets gobbled up by guests. Rhubarb Scrumple: a quick and tasty crumble-style topping for rhubarb or indeed whatever fruit you have to hand. Sorry, no scrumpy involved. Rhubarb, Rhubarb, Rhubarb: a fool, a parfait and an ice cream. Yum. Orange Polenta Cake: a very pretty cake from the uber-talented chef Stevie Parle. Sinfully Tempting Devil’s Chocolate Cake: the chocolate cake to end all chocolate cakes. Our chocoholic niece’s new favourite. Sunshine In a Bottle (And a Chocolate Cake): this is all about extra-virgin cold-pressed rapeseed oil and includes a divinely fudgy Chocolate Almond Cake. 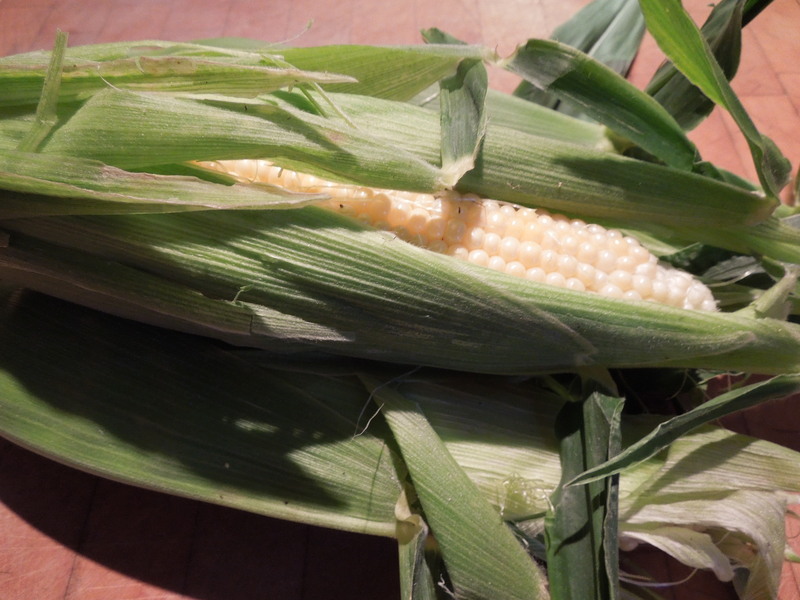 Sweetcorn: barbecued, frittered, made into a more-ish American-style bake plus a very good relish. Cheesy Potato Farls: lovely with an egg on top! New Ways With Old Veg: new to me anyway. A couple of different ways with celeriac and cauliflower. Blessed Are The Cheesemakers: make your own labneh, a lovely Arabic soft cheese using yoghurt. Devilled Cashew Nuts: quick and easy and delicious with drinks. Asparagus, I Love you: well, I do, I can’t get enough of it. Two ways of making Hollandaise Sauce to dunk it in. Crystallised Flowers: an almighty fiddle if you’re as cack-handed as me but a very pretty way of decorating your cakes and desserts. This entry was posted in Desserts, cakes and biscuits, Eggs and dairy, Fruit, In the garden, Jams and jellies, pickles and preserves, Odds and ends, Sauces, Soups, starters and canapes, Vegetables and salads, Vegetarian and tagged National Vegetarian Week, vegetarian food by Linda Duffin. Bookmark the permalink. I’m Tracey and I’m following your blog. I own http://www.thelocalproductcompany.co.uk and I’m doing quite a lot this week on National Vegetarian week. I wondered if it would be ok to put a piece on our blog about yours and a link on Twitter and FB. I’m going to be featuring one of our curry sauce company’s and a few others this week as well, so this would fit nicely. I hope this will be ok with you, but let me know if you have any questions about us. Local sourcing, great, I’m a big fan. I’d be happy for you to to link to Mrs Portly, many thanks. I’ll look out for your posts this week. Thanks for getting back to me. I’m just adding on some new companies at the moment and doing lots of scheduling work as I am away from 23rd May to 3rd June. You know how it is when you are going away, lots to do and not enough hours to do it! I’ll hopefully get some blog work done later today though. I know that feeling! Looking forward to reading the latest on your blog. What a load of excellent veg! Well done. Part of me says I should do more of it more often. I must try harder!